Container living has become an interesting lifestyle choice in recent years. 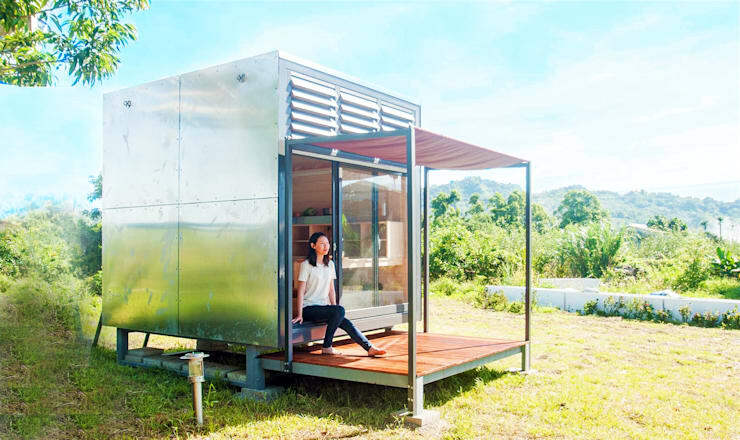 With creativity and innovation, we have been seeing a number of container-type abodes evolve from just scraps of metal with inferior interiors into high quality and high class houses worthy to be called homes. 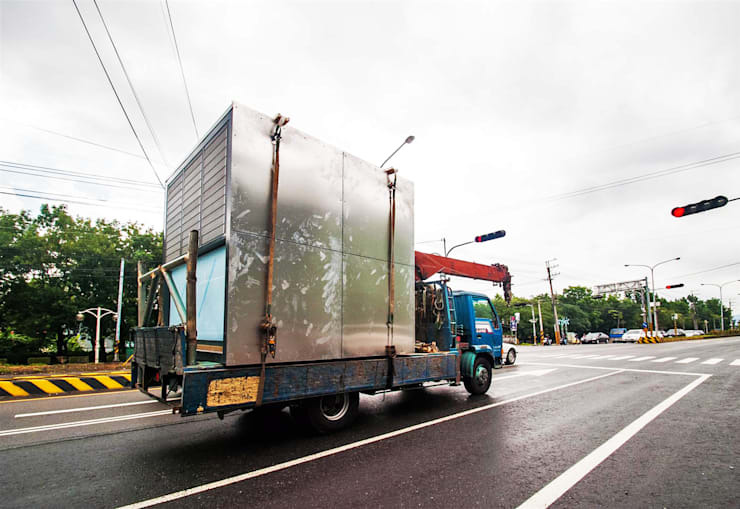 In Taiwan, interior architects from Famwood Natural Red House came up with the Qcamp, a steel-clad cubic house that has more to it that it meets the eye. Let's take a closer look at what it has to offer. With just 7 square meters, it's quite hard to imagine that this much space can fit a lot inside. And yet, it does. 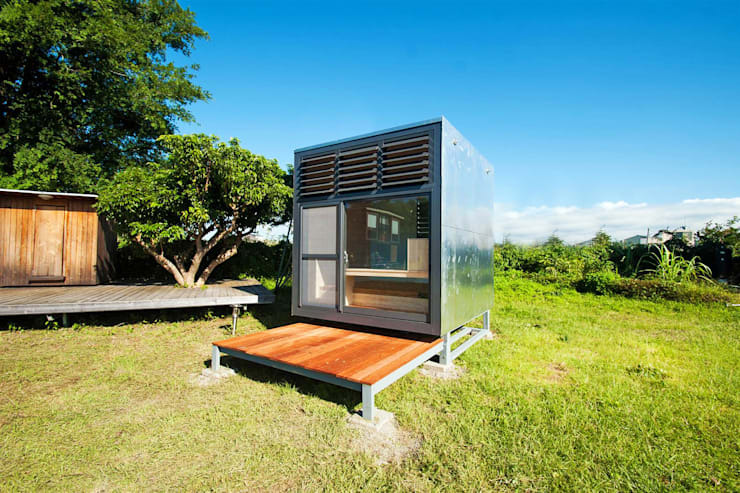 The boxy structure houses a bedroom, bathroom, and kitchen. Priced at about 2.5 million pesos, the Qcamp is your unexpected little getaway. Primarily, the exterior is made up of steel sheets that have a moisture-proof ventilation system to protect its interior materials. So, it can be securely situated, the house is mounted on cemented foothold with a wooden platform. What once was just a platform to reach the inside has easily been converted into a front porch with an adorable awning. This spot is perfect for late afternoon musings or early morning meditations. Glass panels compose the sliding doors and window of the house. These doors open to a warm wooden-clad interior. The smooth paneling and carpentry here contrast with the industrial steel effect of the exterior and gave us a hearty surprise. 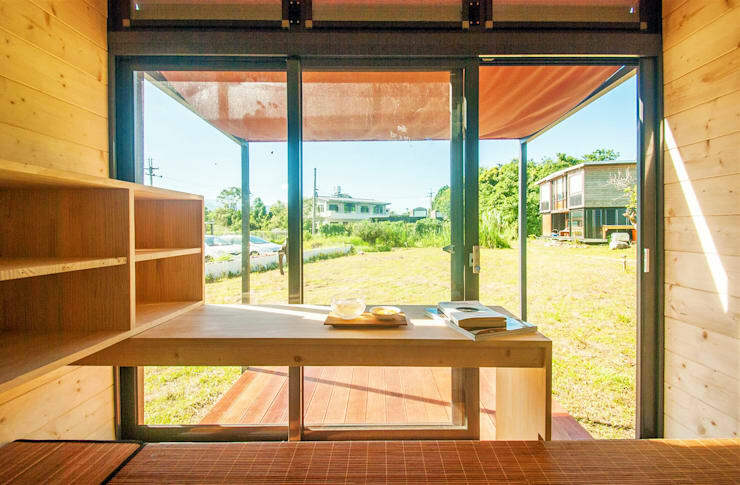 Nonetheless, we're loving the fact that the wooden interior exudes a cozy vibe and that the awning outside provides the right coverage for the glaring sun. Just because it's small and container-looking doesn't mean that style and function have to be compromised. The kitchen allows the homeowner to quickly turn his freshly picked and gathered ingredients into a sumptuous meal. He may even enjoy the feeling of being a chef with these organized compartments and shelves. 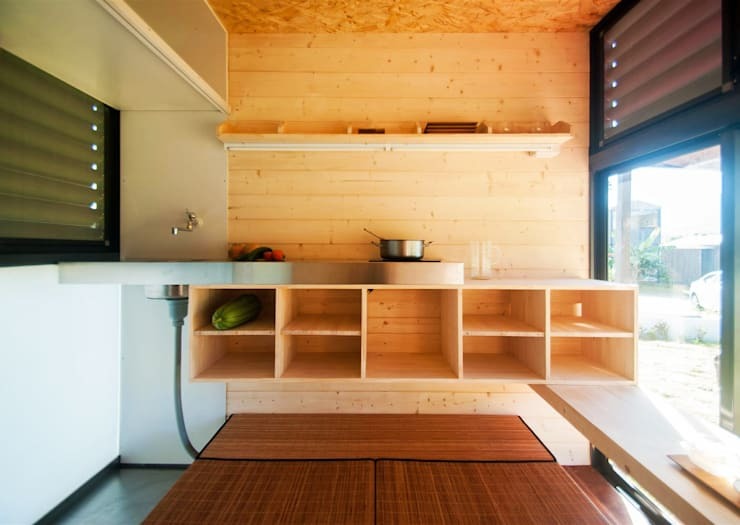 Meanwhile, to maximize space, extended planks of wood serve as tables for dining and for having indoor conversations. If ever you feel like moving out, with the Qcamp, you can just load your house on a truck and transfer residence. Another advantage is that, this house can also serve as a camping cabin so that you won't have to constantly look for lodging or pay a ridiculous amount of money for hotel accommodation. Check out this space-savvy home on wheels too!